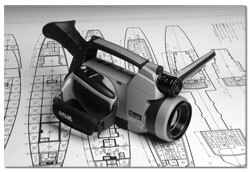 Using infrared camera technology, our technicians can detect potential trouble spots in electrical equipment, wiring and transformers. The early detection of these problems can avoid costly major repairs and expensive downtime on revenue producing equipment. Fires, unscheduled outages, and lost production due to electrical anomalies can be avoided by using infrared thermography on a regular basis. 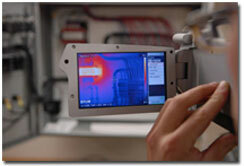 By using Thermography, a visual inspection of electrical equipment takes on a whole new meaning. One of the advantages of thermography is that the inspection can be conducted whilst the electrical system is live with actual load currents being drawn. The inspection shows any areas of weakness as in loose connections and overloads.